When I first saw the Gundam Barbatos Lupus Rex in action during the second season of Iron Blooded Orphans, I was ecstatic. The animalistic look, the grandiose arms, the enormity of its mace, and the magnificent V-fin that crowns its head all captured the true Gundam fan in me. This was even before the Barbatos revealed its tail! At that moment, I made up my mind that I was going to get my hands on that 1/100 variant. I’m a sucker for inner frames, and sometimes, I love to take apart IBO kits just to admire them for a while. The 1/100 Full Mechanics line, developed specifically to capture the detail of Iron-Blooded Orphans models like this one, is perfect for that. The amazingly detailed inner frame just begs to be looked at, so I decided to go the extra mile to paint all the tubings and pistons with Sharpie oil-based gold and silver paint, as you can see in the pictures. Without the paint, the inner frame is a simple flat grey but nevertheless, looks phenomenal. The exterior design of the Barbatos Lupus Rex is probably my favorite out of the IBO series. The design seems to have adopted the look of the Hashmal, which makes sense because in the story, the Hashmal is converted into the Lupus Rex after Mikazuki defeats it. It’s a great add-on to the original Barbatos, and the addition of the tail has given it a more predatory aesthetic. From its sharp edges to extravagant proportions, the Lupus Rex has a fierce personality and an unique silhouette that sets it apart from any Gundam kit in my possession. The classic Gundam colors from the RX-78-2 have been transitioned even into the IBO universe, and on the Barbatos, it’s as striking a color scheme as ever. White highlighted by red, blue, and yellow bring out the boldness of this model, creating a look that ought to catch your attention. I highly recommend whipping out your paints (or pencils) and panel-lining this kit to bring out those details and allow the “King of Wolves” to be displayed in all its glory. Like other 1/100 Full Mechanic builds, the Barbatos Lupus Rex has the builder begin with the inner frame and then place the armor on top of it. Between creating the inner frame and stacking on the outer parts, the former is probably more difficult. Although the process isn’t as hard as building a Master Grade, it is definitely beyond any High Grade you’ll encounter. If you’ve built at least a few High Grades already, don’t let this increased difficulty deter you because it’s a very engaging build. I was able to put it together using just my Tamiya basic tool set. Despite the inner frame’s superb articulation, the addition of the external armor hinders much of the movement provided. Each arm and leg joint can go a little beyond 90 degrees and the ankles can swivel about 45 degrees before being stopped by the plating. Although the head can look down, its ability to look upward is prevented by the size of the head and the collar. The abs can move slightly forward and backward as well as side to side and the pistons add a nice little mechanical touch to kit. On the backside of each forearm, there are secondary manipulators which can bend at 3 points and can hold an additional weapon from other 1/100 kits. The articulation of this kit isn’t as great as I expected it to be, but it’s still possible to pose the Lupus Rex in impressive stances that still convey its aggressive design. In addition, you’ll get the enormous mace with its extendable pole and pile bunker, allowing you to extend the darn thing up to 13.5 inches (34.4 cm for my metric friends). The kit also comes with a little height-adjustable stand you can use to help the Barbatos hold the mace up in a position that would be too heavy without it. Additionally, there’s an attachment that can be used to store the mace on the rear waist of the mech. However, my favorite part of this build was the metal wire that gives you the ability to pose the tail at any angle imaginable. It easily secures onto the backpack and is relatively easy to pose (but I’d recommend lining it up against some sort of curved surface, like a tennis ball, to help mold it into a nice smooth shape). If I ever say I hate the Barbatos Lupus Rex, call the cops because that means I’ve been a victim of identity theft. From its extensive detailing to its demonic appearance, I LOVE everything about this kit. Yes, its articulation is lacking, but the sheer quality of everything else allows me to overlook that. As for the weapon, what doesn’t change up the pace better than a giant mace? The designers of this mech took a risk by engineering a Gundam with such strange proportions and in my opinion, it was a risk that paid off, resulting an amazingly unique Gundam. It makes sense that Lupus Rex means “Wolf King” in English, because to me, the 1/100 Full Mechanics Gundam Barbatos Lupus Rex is truly a model kit fit for a king. Ryan is a senior in high school that loves to build Gunpla models whenever he’s not caught up in schoolwork or swimming. 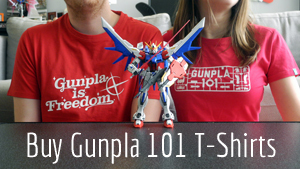 He began creating Gundams in 2015 and since then, has made the hobby his passion. While he’s waiting for the next kit to build, Ryan enjoys filmmaking, playing video games, and hanging out with his cat. Whenever he finishes a build, he likes to take photos of them and post the photos on Instagram.